Inspect all tire pressure monthly (including the spare) when the tires are cold. Maintain recommended pressures for the best ride, top handling, and minimum tire wear. Use the pressures specified on the vehicle tire information placard or tire label for optimum service. 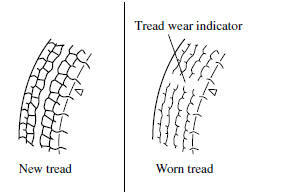 To equalize tread wear, rotate the tires every 12,000 km (7,500 miles) or sooner if irregular wear develops. During rotation, inspect them for correct balance. • Incorrect tire pressure • Improper wheel alignment • Out-of-balance wheel • Severe braking After rotation, inflate all tire pressures to specification and inspect the lug nuts for tightness. Rotate unidirectional tires and radial tires that have an asymmetrical tread pattern or studs only from front to rear, not from side to side. 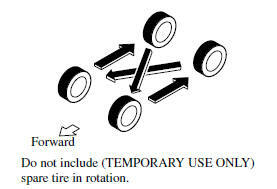 Tire performance will be weakened if rotated from side to side. ● Tires not sufficiently inflated If these instructions aren't followed, the rotation of the left and right wheels will be different and will thus apply a constant load on the limited-slip differential. This will cause a malfunction. Always use tires that are in good condition: Driving with worn tires is dangerous. Reduced braking, steering, and traction could result in an accident. Tires degrade over time, even when they are not being used on the road. It is recommended that tires generally be replaced when they are 6 years or older. Heat caused by hot climates or frequent high loading conditions can accelerate the aging process. You should replace the spare tire when you replace the other road tires due to the aging of the spare tire. The period in which the tire was manufactured (both week and year) is indicated by a 4-digit number. Refer to Tire Labeling 5. The way you drive has a great deal to do with your tire mileage and safety. So cultivate good driving habits for your own benefit. If you feel a sudden vibration or ride disturbance while driving or you suspect your tire or vehicle has been damaged, immediately reduce your speed. Drive with caution until you can safely pull off the road. Stop and inspect the tire for damage. If the tire is under-inflated or damaged, deflate it, remove the tire and rim and replace it with your spare tire. If you cannot detect a cause, have the vehicle towed to the nearest vehicle or tire dealer to have the vehicle inspected.